Vancouver, BC, January 10, 2014 - Engagement Labs Inc. (EL.V) made some announcements this week that are sure to create some social media buzz. With Engagement Labs being a leader in social media optimization, they will certainly be in a position to analyze the resulting social media activities across all online channels including social media sites, forums, news and blogs. 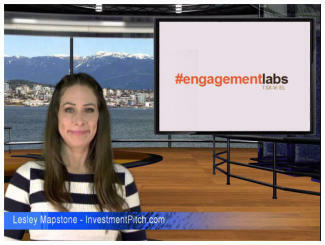 InvestmentPitch.com has produced a "video news alert" discussing this news. If this link is not enabled, please visit www.InvestmentPitch.com and enter "Engagement" in the search box. Engagement Labs offers a software-as-a-service ("SaaS") integrated suite of modules, branded #esuite(TM), which measure real-time brand efficiency in generating engagement on a company`s owned and earned social properties, in areas such as social monitoring, social publishing, social analytics and social conversion. You can be excused if you`ve never heard of the company, as prior to its December 30th annual and special shareholders` meeting it was known as Parta Dialogue Inc. In addition to the name change, the shareholders also approved a share consolidation of 1 new share for 10 old shares, which leaves the company with only 7.3 million shares outstanding. Starting this week with a capitalization of less than $2.2 million, the company has, arguably, one of the strongest Board of Directors of any company we`ve seen listed on the TSX Venture Exchange. G Scott Paterson, who currently sits on the boards of several TSX and TSX Venture companies, joined Engagement Labs` board yesterday and will assume the role of non-Executive Chairman. Mr. Paterson is no stranger to the venture markets having previously served as Chairman of the Venture Exchange and Vice Chairman of the Toronto Stock Exchange. He was previously the Chairman and CEO of Yorkton Securities, where he led Yorkton to be Canada`s leading underwriter of technology, internet, film & television companies. He joins a board of heavy weights, which includes Ed King, currently Chairman of Caldwell Partners International, and the Former Chairman & CEO of Wood Gundy Ltd. Mr. King, along with Engagement Labs` other directors, sits on an impressive number of other boards. The company has engaged D & D Securities to complete a private placement of secured convertible debenture units, of between $1 million and $10 million, on a "best efforts" basis. Mr. Paterson has agreed to subscribe for $500,000 of this financing. For more information, please visit the company`s website www.engagementlabs.com or contact Paul Allard, President and CEO at 514-831-4245 or by email at paul.allard@engagementlabs.com. InvestmentPitch.com, a multimedia company that provides a combined solution for creating and hosting financial video content, and distributing it across multiple platforms to investors and financial professionals, specializes in producing short three minute videos based on significant news releases, research reports and other market information. Please visit InvestmentPitch.com and browse the extensive library of investment videos.